SEAT continues its product offensive with a significantly expanded vehicle line-up. The Alhambra is now also available as a 4WD model with permanent all-wheel drive. With its high reserves of traction in every situation, the SEAT Alhambra 4WD adds a whole new dimension to its versatility for families, leisure, business and hobbies. Thanks to the powerful and efficient 2.0 TDI power unit with 103 kW (140 hp) and its great handling dynamics, the successful and highly acclaimed multi-purpose vehicle offers a unique combination of extremely high utility and reliable handling under all conditions. With its permanent all-wheel drive, the new SEAT Alhambra 4WD offers a major benefit in traction on all types of surfaces and in every situation. Safety and mobility under wintery road conditions benefit just as much as its characteristics as a towing vehicle. At the same time, the next-generation electronically controlled all-wheel drive is set up for optimum handling. Thanks to the sophisticated design and perfectly tuned running gear, the SEAT Alhambra stands by the spirit of the brand by offering a high level of sporty driving fun - something thus far unexpected from an MPV. Nevertheless, the Alhambra's excellent long-distance comfort remains fully intact. Its dynamic handling, refined directional stability and excellent body roll characteristics, delivered by its sophisticated chassis and suspension, make every new Alhambra a pleasure to drive. 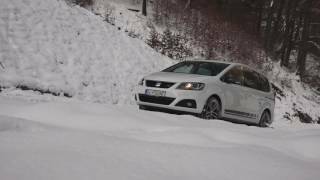 The SEAT Alhambra 4WD builds on the capabilities of the front-wheel drive models with a significant increase in traction under all road conditions. Plus, the all-wheel drive system has been perfectly integrated into the Alhambra without significant changes to the chassis. The power to the rear axle flows via an angle drive on the front differential and the drive shaft to the Haldex coupling. In order to further improve the already good axle load distribution, it is mounted at the end of the drive shaft together with the rear differential in a single casing. This all-new component is extremely compact and highly robust. Running in an oil bath inside this electronically controlled coupling is a multi-disc package that can be pressed together via regulated hydraulic pressure in a continuously variable fashion. The driving force sent to the rear axle is dependent upon the pressure applied. The necessary operating pressure is supplied by an electric annular piston pump, with a pressure accumulator maintaining a constant oil pressure of 30 bar. As a result, the Haldex coupling can operate extremely quickly via an electronically controlled valve, delivering a clear benefit in difficult driving situations. The second and equally important advantage - earlier all-wheel drive systems could react only to the differences in rotational speed between the front and rear wheels. In contrast, the all-wheel coupling on the SEAT Alhambra 4WD receives its orders entirely from electronic intelligence, thus enabling it to take anticipatory action in combination with ESP and ABS. When pulling away or accelerating, for instance, a great deal of torque is required at the rear axle - the discs are pressed heavily together and a lot of power is diverted rearwards. In an extreme case and to avoid spinning front wheels, the system sends all the driving force to the rear. Under constant driving conditions, on the other hand, very little power is required at the rear axle. The coupling opens substantially, which has a positive effect on fuel consumption. Under braking, the coupling opens completely, with no power flowing to the rear. This all-wheel drive system can exercise the full extent of its capabilities as soon as handling systems like ABS, ESP and EDS kick in on slippery road surfaces. Depending on the particular situation, the coupling can be opened for an ABS intervention, or closed for ESP input - in either case, this happens quickly and smoothly. The SEAT Alhambra 4WD is equipped with the 2.0 TDI with 103 kW / 140 hp and six-speed manual gearbox. It combines powerful performance with excellent efficiency. Top speed stands at 191 km/h, while acceleration to 100 km/h takes 11.4 seconds. Yet the TDI consumes an average of just 6.0 litres of diesel per 100 kilometres, equating to a CO2 figure of 158 grams per km. This is thanks in large part to the Ecomotive package with brake energy recovery and stop/start system. It is also equipped with an SCR catalytic converter (Selective Catalytic Reduction), a technology that makes the SEAT Alhambra 4WD one of the world's cleanest diesels. 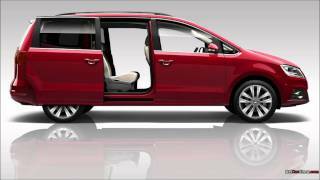 The SEAT Alhambra 4WD is offered as a five-seater in the Reference and Style lines. The extensive standard equipment and many hi-tech options are the same as those offered for the front-wheel drive models. As an alternative, the Alhambra 4WD will also be available in a version with seven generous individual seats. 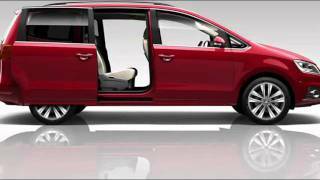 The Alhambra has the perfect format for a versatile MPV. At 4.85 metres, it is 22 centimetres longer than its predecessor. It has also gained an additional nine centimetres in width, taking it to 1.90 metres. These dimensions deliver an exceptionally generous amount of room, with ample space in the third row for adults. The long sliding doors, which are also available with electric operation in the Style equipment line, offer easy access to all seats. The luggage compartment is also more than generous - measuring 2,430 litres, almost 2.5 cubic metres, when the second row of seats is folded in the five-seat version. One focus of SEAT's development work on this car was on the intelligent and highly flexible seating concept. In its home market, the new Alhambra is available with either five or seven seats. With the new "EasyFold" system, the second- and third-row seats can be retracted into the vehicle floor in just one movement. Moreover, the second-row seats can also be positioned sideways, with integrated child seats available as an option. The driver seating position combines the best visibility with perfect ergonomics. The design makes the dynamics of the new SEAT Alhambra clearly evident from the first glance. The broad, taut proportions, the clear lines and the distinctive wheel arches create an appearance that exudes a powerful presence. With the arrow-shaped bonnet, the characteristic SEAT grille and the powerful front skirt also sporting the arrow design, this large MPV sends a clear signal that it is part of the SEAT family. A subtle roof spoiler, the downward sweep of the hatch and large light clusters dominate the rear of the vehicle. An electrically actuated rear hatch is available as an option.